Recently, I was looking at a specific use case for monitoring software. My requirement was to monitor the performance of business applications that end users of my customers use daily from multiple locations. The customer needed to know how long it takes for the user to logon, how long before the user has the application available for use, and how long it takes when a user enters a customer name or ID in a search field to see the results show up on the screen. In this context, I evaluated a part of the eG Enterprise monitoring solution for Citrix. eG Enterprise offers many features, but for this requirement, I focused on the synthetic monitoring capabilities. Synthetic monitoring simulates a real user accessing the application every few minutes. eG Enterprise provides two ways of synthetic monitoring, which I will discuss below. 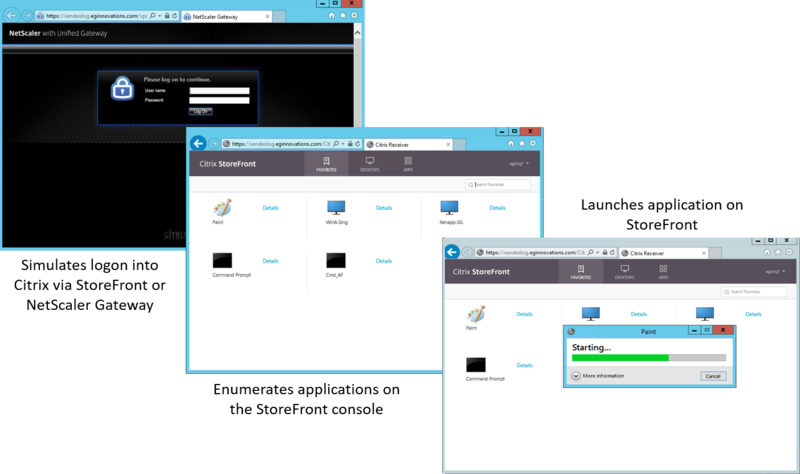 eG Enterprise has a built-in Citrix logon simulator that focuses on logon performance monitoring. This tool monitors the entire logon process – from browser access, Citrix StoreFront (or NetScaler) logon, Active Directory authentication, desktop enumeration, Citrix XenApp/XenDesktop session establishment, application/desktop availability, and until application/desktop launch. You can zoom in on individual steps of the logon process to see how much time it took for each step to execute. Using the results, you can easily identify which step is causing logon slowness. 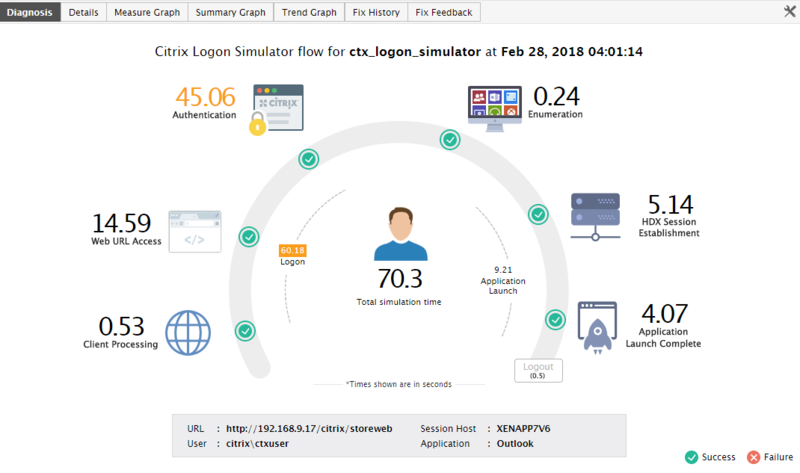 The logon simulator is a proactive monitoring tool: it tests the Citrix infrastructure remotely and proactively alerts you to problems before real users connect to Citrix session and experience issues. It allows you to test your XenApp and XenDesktop infrastructure 24×7 from any dedicated VM/PC using periodic simulation of pre-defined user logon conditions. It uses browser-based scripting on Google Chrome and performs the simulation. Admins can get regular assessment and reports of logon performance across any locations. The logon simulator can also be run from different locations, which helps you compare and analyze differences in logon performance across locations. Getting started with the logon simulator is very simple. Just configure the Citrix Site URL, enter the names of applications/desktops to be simulated, and set up frequency of monitoring. The simulation will automatically run from the dedicated VM/PC and alert you to performance deviations. This is the logon simulation dashboard. 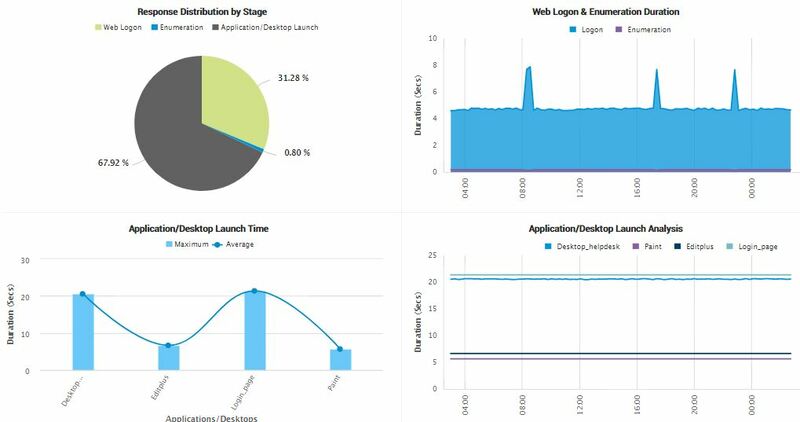 Here you can view the list of applications/desktops for which simulations are running and the status of logon performance, application availability and application launch. Clicking on the magnifying glass icon on the right-hand side, you can drill deeper into the logon process, and view intuitive step-by-step breakdown of time take by each step. Alerts get sent right into your inbox, so you can always be notified of slow user logon issues. 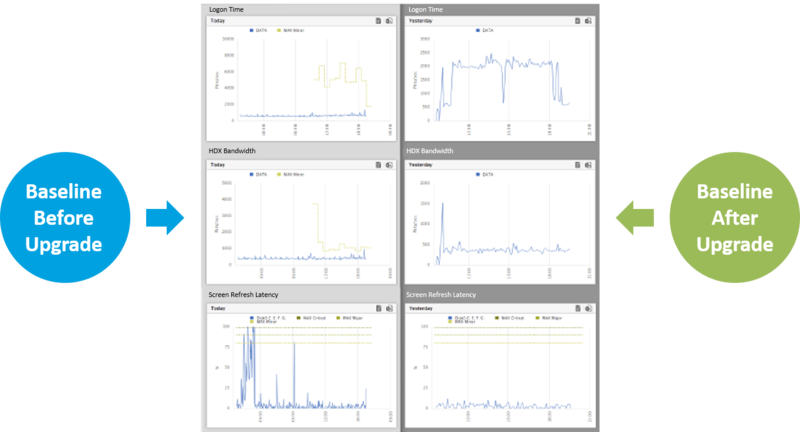 Historical reports are also available to evaluate the logon performance over a specified period of time. The next functionality I tested out was full session simulator. Like the logon simulator, this is also a synthetic simulation tool and does not require an agent on the Citrix XenApp servers or XenDesktop VMs. It goes one step beyond the logon simulator by providing the ability to measure when the application has started and when one or more actions in the applications have completed (such as opening the tab where you can search on customer name and ID). This is a very powerful option that can help you to determine how long an end user needs to wait until he or she can really start to work in an application after logging in to the environment. This simulation can be done from multiple locations too and be fully automated. As soon as the performance drops for a location compared to the other locations, you will be notified instantly. With the statistics that the tool provides, you can quickly pinpoint what caused the performance drop and start working on a solution right away. There are differences in function and operation between the logon simulator and full session simulator. Functional difference: Logon simulator only simulates from logon until application/desktop enumeration and launch. But the full session simulator simulates from logon, enumeration, launch, all the way through different steps of application access by the user. The logon simulator will stop simulation when say, an SAP application is launched (i.e., the simulation ends at the point when the web browser stops being the client). 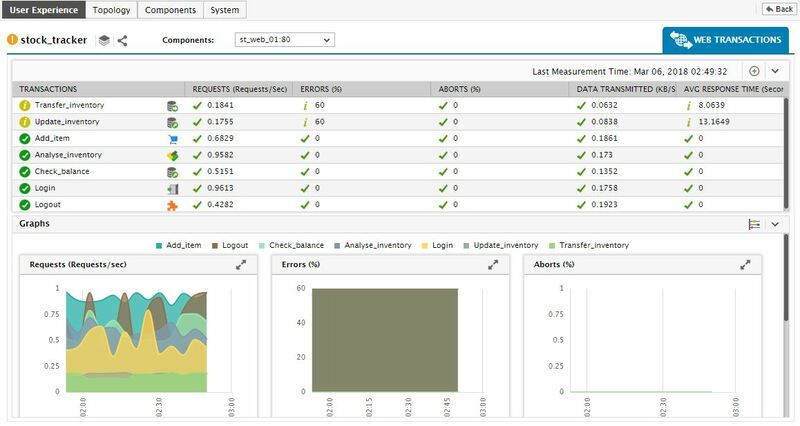 But, the full session simulator will continue the simulation to include the SAP application access, specific transactions performed by the user, and then through application closure and session logout. 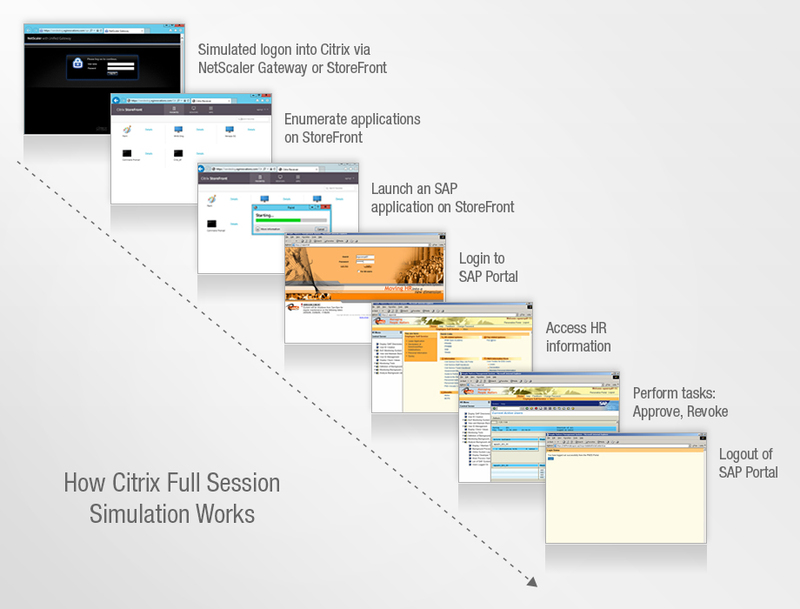 In a nutshell, the full session simulator tracks the entire Citrix session, including all user transactions performed on applications. Operational difference: While the logon simulator uses browser-based scripting to run simulations periodically, the full session simulator uses a record-and-playback function, which is also executed by a script. All the operations in a Citrix session are captured and played back at regular intervals from different locations to identify issues during user’s application access. This may mean that the full session simulation requires additional set up and configuration compared to logon simulation. Which option is the right one depends on what use case one has and what approach they want to use for Citrix user experience monitoring. Both monitoring options can also be very useful when you perform an upgrade of the environment or make changes that can impact logon performance and application startup time performance. The current Spectre and Meltdown patches that might impact application performance are a good example of how this can help you to provide a baseline before a change and a new baseline after the change. For my customer, the full session simulator was what they were looking for. The startup performance for the business-critical application up to the availability of the search tab will now be checked and measured from multiple locations so the administrator can quickly act if slow performance has been detected. This customer is not on the LTSR version of XenApp. So, when a new 7.x version will be implemented the full session simulator will also be used to provide a performance baseline. eG Innovations offers an express version that allows you to test the logon simulator for free: www.eginnovations.com/express. Previous story Dell XPS 15 9550 and Windows 10 Insider Builds – Don’t do it.